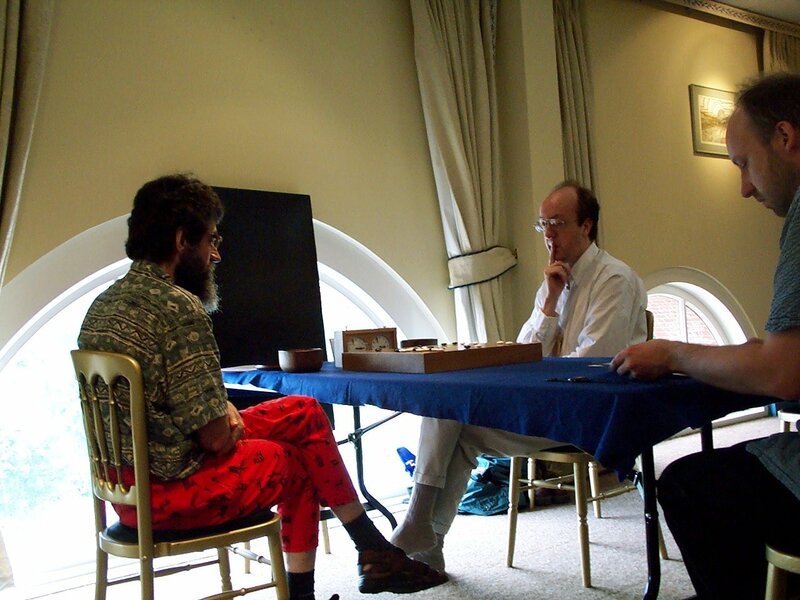 This was played as part of the 2000 Mind Sports Olympiad. 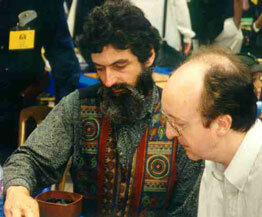 Matthew Macfadyen (left) and Des Cann (right) discussing their first game. In game 1, Des was ahead for most of the game, and Matthew would not have won without the komi. The game record is available here in SGF  and Ishi  formats, with comements by Seong-June Kim, 6 dan, and Charles Matthews, 3 dan. Matthew won the second (SGF /Ishi ) and third (SGF /Ishi )games by resignation to retain the title 3-0. These games come with brief comments from Matthew. Des won his right to challenge Matthew for the title by winning the 8 player all-play-all Challenger's tournament  with a clean sweep. To get into the Challenger's league, players had to do well in the Candidates' Tournament , which was held on the 18th and 19th of March.